This raincover is specially designed for the Jane Twone in Twin/Double mode, however it can also be suitable for most similar in-line tandems which already have a fabric hood to support it. The design of this raincover has no frame which in turn allows it to be easily folded, compactly away. Jane's range of practical raincovers will keep your little ones protected and comfortable while you're on the move. These exclusively designed raincovers help to protect against the wind, rain, and also aids air circulation and prevents temperature build-up with the mesh and/or exclusively designed roll up window(s). Universal type in-line tandem raincover, but has been specially designed and tailored for the Jane Twone range of pushchairs. Reinforced with mesh to prolong life of the accessory. Unlike a single raincover, this Twone Twin raincover can be used on the Jané Twone in both single and double modes. Raincover has two handy little windows that open so you can get to each child easily. I have purchased the raincover as I enjoy getting out and about and theres nothing worse than getting coughed in the rain. Great cover, great product. 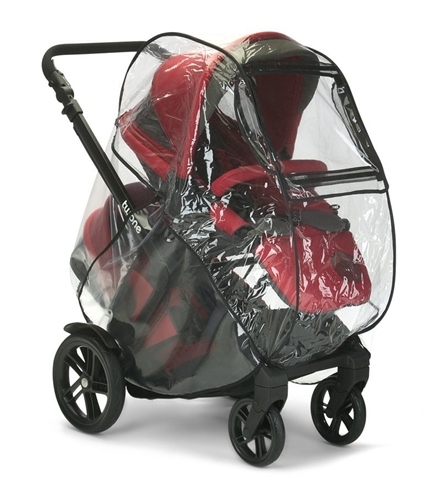 This rain cover is very good, it actually covers the whole pushchair. It is a bit confusing on which way round it goes but I got it in the end.